St Patrick's celebrations were great, we took one day to recover in the St Augustine Florida sun, then we were off to Savannah, Georgia. 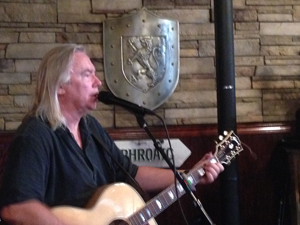 I had three gigs in the three Molly MacPhersons Scottish pubs. I played on the Saturday in downtown Savannah. It was a fine crowd for a Saturday afternoon - ranging from a reunion of helicopter pilots from the Vietnam war to the pipe major of the Savannah pipe band. On Sunday, I played at 1pm in the Pooler Molly MacPhersons - a brunch crowd who rose to the occasion well and a wee toddler who kept putting $1 notes in my tip jar and beaming... I liked him ! 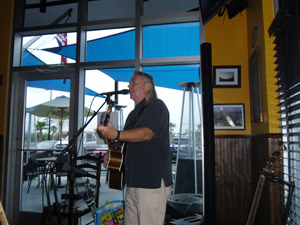 Sunday at 5pm I played in Mollys in Richmond Hill - a dinner crowd and appreciative audience, they enjoyed it and I played lots of Scottish songs and ballads - a bit of a change from the thrashing Irish songs from a week earlier (I enjoyed that too). 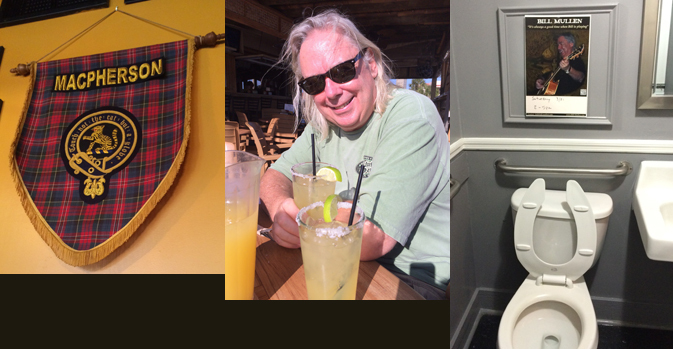 After Sunday, I was done with gigs for a wee while and have been enjoying time in Savannah, Charleston South Carlina (no Dundee), Roanoke Rapids, North Carolina and now outside Washington DC at Bull Run, Virginia. Above Left outside of Molly MacPherson's Savannah ; Middle - its Dorothy! Right - the Molly Macpherson delivery truck in Pooler - note that it's parked under a Kelly's sign... my Granny was Annie MacPherson and my Grandad was Patrick Kelly... coincidence ??? On the following Saturday we were at Jock the Box's gig in Molly MacPhersons (we enjoyed his session - his film theme medley was funny and very well done - including Scottish Mohican chants in the Last of the Mohicans). 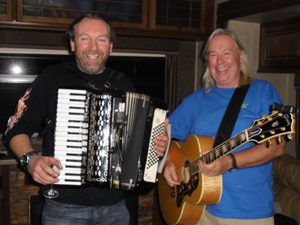 We invited him back to our wee palace on wheels, what a laugh, there was whisky and a wee jam session. The tour we dreamed up for next year would be fun! Jock, from Stirling, played for years with Box O' Bannannas and supported the Stranglers on many occasions. The gig in Washington DC fell through - now that I'm here I can see why Dorothy was quite pleased - the traffic is awful.